- And now you can add one more thing to your list: Eating dates. Of course this study was limited by it’s size but there’s no harm in eating dates during pregnancy, so why not give it a try? 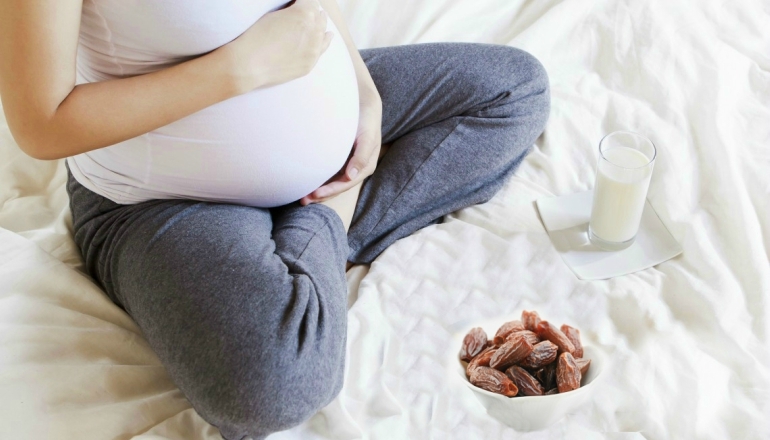 So why does eating dates during pregnancy help mamas-to-be? Natural sugars (fructose) that easily break down in the body and won’t spike blood sugar levels but will offer high energy, which makes dates during pregnancy or labor an excellent choice. Fiber – Helps you stay full, relieves constipation, and lowers your risk for gestational diabetes and preeclampsia. Potassium – One of the best electrolytes. It helps maintain water/salt balance which helps regulate blood pressure. Magnesium – Support muscular health and helps to alleviate muscle spasms and cramps in pregnancy. Folate – Getting enough folate will ensure that your baby’s spinal cord matures properly, avoiding neural tube defects. Vitamin K – maintains proper blood clotting and healthy bones. When should I start eating dates during pregnancy? In the study referenced above, pregnant women began eating dates four weeks before their estimated due date. In other words, at 36 weeks pregnant they began eating six date fruits per day. Of course, you can begin eating dates earlier in your pregnancy if you like. Keep in mind that dates are high in sugar, so if you have blood sugar issues or if you’re worried about group b strep, go easy on them early in pregnancy. But, by all means, start eating 6 dates a day from 36 weeks on! Dates are a healthy and delicious snack, so how can you add them to your diet? Actually, it’s pretty easy since they are sweet like candy. - Add dates during pregnancy in this awesome oatmeal recipe. - Add dates to replace sugar in your favorite recipe or to sweeten your homemade almond milk. - Use dates and nuts to make an easy pie crust in the food processor. - Add soaked dates to homemade nut butter for a sweet treat. - Add dates to sweeten homemade salad dressing. - Add dates during pregnancy easily with these yummy (paleo friendly) bars made from dates. Where can I buy good organic dried dates?